One year ago I opened up an investment account with one of the new online portfolio management companies that have been taking the financial services landscape by storm. I wanted to see how these type of Robo Adviser services work and more importantly perform. I deposited $5,000 of my own money and decided to track how it performed and capture any notable observations on my blog. So let’s dive in and check how much money my ROBO made for me this past year. First let’s look at the portfolio returns. My ROBO portfolio lost money last year. 2.15 percent to be exact. Then again many stocks and ETF’s lost money last year. The learning point here is that ROBO services can lose money just as well as other portfolio management services. Don’t expect any marketing campaigns to tell you this. The thing is…it’s OK. To expect ROBO advisers to be perfect and make money on every holding is unrealistic. In terms of asset allocation of my ROBO portfolio, below is the breakdown at year-end January 28, 2016. Remember, when I setup my account, I answered a series of questions that assessed my risk tolerance and subsequently determine the type of portfolio the Robo Service would create and manage for me. In my case, because I have a high proficiency and literacy about stocks and investing, ROBO proceeded to rate me as a 9 out of 10 on the risk tolerance scale. The table below outlines the asset allocation when I setup my ROBO portfolio in January 2015 along with the current asset allocation. 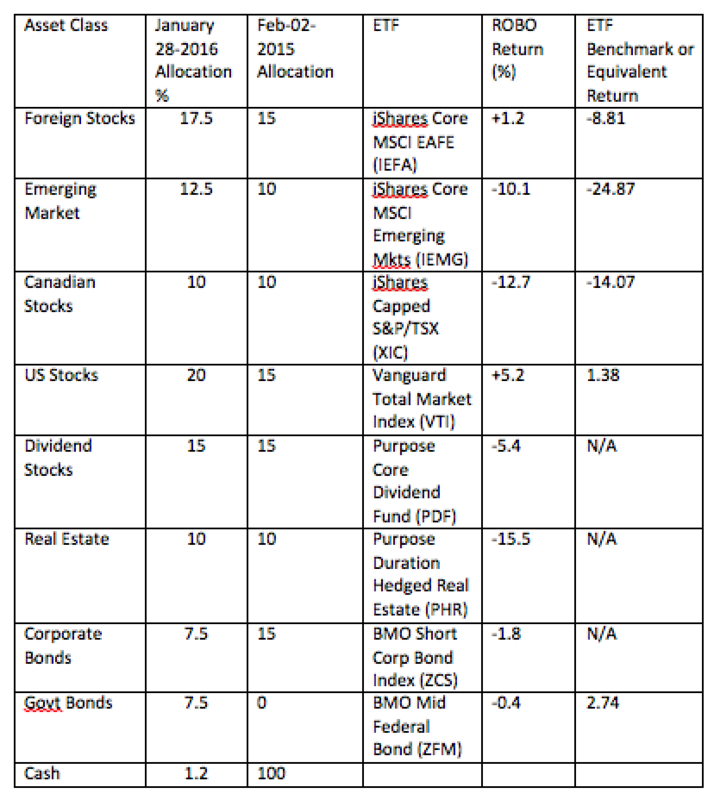 I've also tried to compare the 1 year returns of each asset class/ETF with a similar benchmark index where possible. I tried to put together a weighted average return of an equivalent benchmark for the ROBO portfolio and the most reasonable number I could calculate was approximately -7.46 percent. Based on this, it appears ROBO was relative to other benchmarks able to preserve more of my savings. That's always ideal in a down market. Remember though the point of a ROBO portfolio is to deliver returns that match the overall market. Out performance of various indexes or benchmarks is not expected here. What I do expect from equity components of the portfolio are returns that strive hard to earn at least the long term return of stocks which over the past 125-150 years has been in the 6-8 percent range. Score around there and that my friend is a good year. With exception of the US ETF, nothing really came close to that level of performance. Clearly ROBO didn’t have a good year. It didn't lose as much money as some indexes, but I ended the year with less money than I started out with. Again it’s only one year. The ROBO generated dividends totalling $114.03 or a yield of 2.3 percent, so if you back this out of my total funds return than then my capital losses for the year were 4.4 percent. Not pretty. Below are the transactions ROBO undertook for November until January. During the year a total of 25 Buy orders and 2 Sell orders (Purpose Total Return and Purpose Tactical Hedged ETF’s) were undertaken. There were a total of 50 dividend payments. The amount of buy and sell orders appears to be reasonable. The number of buy orders were on average coming in at about 2 per month. To put this into some context, over the same period, I made 34 trades in my other portfolios, which involved buying and selling mostly individual stocks. To be fair, this is the first year of this portfolio, so you can’t magically have ETF’s land in your portfolio. You have to initiate transactions to build up the positions. Going forward, I am expecting to see only transactions that involve rebalancing the asset allocations. I’m pleased to see that there were only a few sell orders although those sell orders were involving transitioning to a new series of Bond ETF’s. Churn or the amount of rotation into new ETF’s is something I’m particularly focused on because a large number of sell transactions in a passive oriented portfolio can be a signal that the ROBO is being “programmed” to turn over the portfolio. So far the ROBO is behaving pretty responsibly with the only potential signs of churn being the rotation out of the Purpose Bond ETF’s into the BMO line of Bond ETF’s. In terms of transaction costs and management fees, ROBO charged me about $0.10 in advisory fees or 0.002 percent of total assets. I estimated the Management Expense Ratios on the individual ETF’s holdings to be 0.25 percent. Remember though that my ROBO service doesn't charge fees if the portfolio is $5000 or less. If I was investing more money I would have got dinged for at least another 0.5 percent. So factoring these two sets of costs, my total transaction costs for the year came in at approximately 0.253 percent. If my portfolio was greater than $5,000 then my transaction costs would come in at least 0.753 percent which is still decent when you compare it to traditional mutual funds which charge fees in the 2-4 percent range. As I look back at the year and the whole experience of using a ROBO advisor, a few themes jump out to me. Setting up the account was pretty seamless and efficient. Since I set up my account my ROBO has told me I can now setup accounts through my phone. Pretty slick but that’s not why I gave my money to ROBO. I gave my money to them to make me more money. Lesson: Don’t get infatuated with the fact you can setup an account on your phone or at the cottage. it won't pay the bills or the mortgage. I learned I shouldn't expect any expect human contact unless you make the first move. After setup and call with my human "adviser". I never spoke to or heard another voice of a human being for the rest of the year. I’m not really that bothered about this. I expected this when I started. For those who have been managing their portfolios on their own, this dynamic shouldn’t disrupt them. However if you are one to prefer having someone to chat or bounce ideas off of, you can still do it with a ROBO adviser service. You just have to take the initiative. Even though "somebody" else is managing my money, the ROBO adviser model follows very much a Do-It-Yourself kind of culture. I’m dating myself but when I setup a bank account when I was kid, I remember getting a toaster in one case and a transistor radio another time. You thought you found nirvana. Toasters have been replaced with streaming access. In my Robo’s case, I got comp’ed with streaming to an online radio service, but only if I put more money in my portfolio. I guess bribery can be a good way to build up savings. The lesson here is don’t the let the allure of gifts distract you from identifying a service that will give you a good chance to generate the returns you need to meet your financial goals. What will the ROBO do with my money going forward? Will it re-balance? The key premise with a ROBO portfolio is that when components deviate from their asset allocation, the ROBO algorithm will be smart enough to re-balance the portfolio via selling part of the higher performing assets and reallocating them to the low performing assets. Right now it seems that the bond components are over-weighted as well as Foreign Stocks allocation is slightly over-weighted, so I would expect ROBO to sell a little bit of those ETF’s and take the proceeds and allocate them to the other week parts. The question is there enough spare cash to go around? My portfolio is fully invested save about $56. I have no plans to put more money into this portfolio. It will be interesting to see what ROBO will do. With only one year in the books, it is quite difficult to get too judgmental on whether the ROBO model is suitable. Clearly the numbers show we lost money, however it's only one year. To really do it justice, we really need to let this thing run through a full business cycle of ebbs and flows which could be about three to five years to really gauge its viability. In addition, we're looking at only one type of portfolio which is primarily equity based. I would wonder how more balanced portfolios performed. I would love to hear from other people on their experiences. It would be nice if the Robo Advisers could shed some light into this. Until we get there, I will continue to periodically blog and observe the workings of my ROBO portfolio. Onward to year 2!